Life with Plants: Growing My Avocado Tree - Daisy Chains. Hello everyone! Hope everyone has had an amazing Christmas. I’m just doing a super quick post today as I’m currently on holiday writing this on my iPad. The question I get asked quite a bit is how I have managed to get my avocado plant to grow. A lot of my friends have tried themselves to grow their own plants from the pits of their avocados but have failed. All these people have one thing in common: they have done that thing where they put toothpicks into their avocado pit and let it grow in water. I however (as with my mom) have successfully grown avocado plants from simply skipping this step. Instead, I have just placed my avocado pit in some soil and given it plenty of water. At first I was convinced that the pit would never sprout till one day I saw a reddish pink nub sprout out of the soil. Watering it every 3 days, the plant just started to grow incredibly quickly. Soon I will be needing to reply my plant so that it has more time to grow. 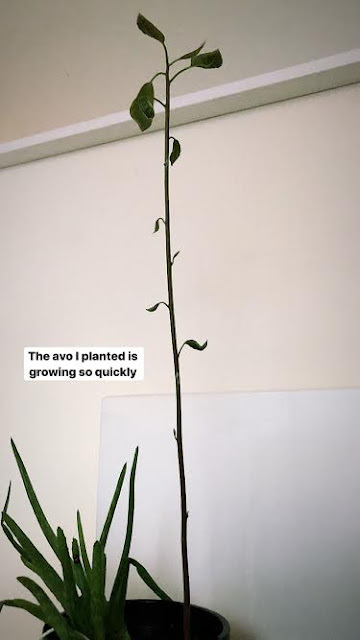 What have your experiences with growing avocado plants been like, does anyone age any tips? 25 year old Half Filipino girl living and working in London. Review: Gugo shampoo with Aloe Vera.